For a writer who was so preoccupied with the interplay of life and death, with mortality and living, and whose works did so much to make me confront death's finality, I was surprised by how hard Ursula Le Guin's death hit me. There was something ageless and eternal about her, and she seemed to pop up everywhere, generous with her words and thoughts and wisdom. Her books are part of the fabric of me. Above all things, she wrote about migration and exile, and she wrote about ordinary, ceaseless, everyday work (particularly 'women's work') in a way that imbued it with a kind of power and magic, and she wrote about the ways women and our work are both seen, and not seen. I remember in particular reading The Tombs of Atuan, Tehanu, and, later, The Other Wind as a teenage girl and young woman and coming to understand the terrible things I would carry, being a woman in this world. Those stories showed me this frightening, inescapable truth, but helped me face it. In some ways I feel that her writing helped me understand how to be a woman. My Twitter profile has always said that I am located in 'Selidor'. I remember reading an obituary of Terry Pratchett that described him as 'both wise and kind', and the same was true of Le Guin. She was kind -- her writing was kind -- without ever being sentimental; it was a kindness that illuminated and educated and pushed you out of your complacency. Not a word was out of place, and her words resonated like stones dropped in clear, still water. And every word served a purpose: striving, illuminating, witnessing without flinching. Doing the work. And now she is 'done with doing', but the words and work remain. I don't usually do Reading Wednesday, but while flailing at naye on Twitter about The Will to Battle, the third in Ada Palmer's Terra Ignota series, I realised I had thoughts about the book, and wanted to discuss them with others in a more permanent, longform location. So, anyway, scattered, spoilery thoughts ahead! Don't expect a coherent review or plot summary - these are just a few bullet points of things that really stood out to me. Anyway, feel free to jump into the comments and discuss anything you want about this book. naye and merit, I know you've both read it, and I'd love to hear your thoughts! I wrote this two days ago on my Wordpress reviewing blog, but I thought it was worth reposting here on Dreamwidth as well. Twenty years ago (or nineteen years, nine months, and about twenty days ago, if you want to get really technical), I was a restless thirteen-year-old, stuck inside during a rainy week on holiday down the south coast of New South Wales. It was the week between Christmas and New Year's Eve, which meant that I was carting around a massive haul of books, given to me for both my birthday and Christmas. I had read all my new books -- all except one, whose cover put me off. My younger sister, fed up with me moping around the house complaining of 'nothing to read,' made the very sensible point that I hadn't read that book. 'I don't like books about animals,' I objected. She insisted. I am forever grateful that she did. 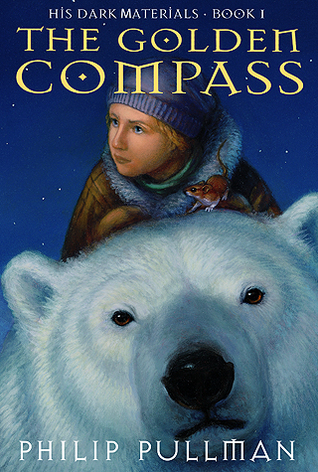 Feeling resentful, I sat down to read Northern Lights (or, as my edition was called, The Golden Compass), the first in Philip Pullman's sweeping, expansive children's trilogy, His Dark Materials. I was hooked from the first page, inhaled the book in one sitting, and, once I'd finished it, opened it up at the beginning and reread it without pause. I reread the book four times over the course of that one-week holiday. It's hard to describe what it felt like, to read that story as a thirteen-year-old. I was already a voracious reader, and I had already encountered many beloved stories, books I would reread incessantly, or borrow repeatedly from the local library. There were already books I felt fannish about, and whose characters I identified with and drew courage from. But this was different. It was like being seen for the first time. It was as if ideas, beliefs and fears I had long felt but was not yet able to articulate had been given voice and shape on the page. As a teenager, my many rereads of Northern Lights (and, after impatient waits of one year and three years, respectively, for its follow-ups The Subtle Knife and The Amber Spyglass) helped guide both my reading tastes, and my burgeoning sense of political awareness. My love of the series got me a paid newspaper reviewing gig at the age of sixteen, and I continued to freelance as a reviewer for various Australian broadsheets for ten years after that. Ten years ago (or, if you want to get technical, ten years, nine months, and a couple of days ago), I was in a bad place. I had returned to my hometown after graduating university, and although I had a good job and a lot of family support, I was desperately unhappy, and felt isolated and directionless. All my friends seemed to have adjusted to adult life in a way that I was incapable of, and I felt left behind. In a fit of desperation I — who mistrusted the internet and who barely went online except to check email — typed 'His Dark Materials fansite' into Google. I found something that saved me. 2007 was not a good year, but it was made infinitely more bearable by the incredible collection of people — most of whom lived on the other side of the world — who hung out in the forums of that site. Most of them had been there for years, and were all talked out about His Dark Materials, so instead they analysed other books, shared music tips, or just vented about their daily lives. Although by their standards I was a latecomer, they welcomed me with open arms. For a long time, the only thing that got me through the day was the prospect of hanging out in the IRC chat room they'd set up — the international composition of this group of fans (plus the fact that most of them were students or otherwise kept odd hours) meant that someone was always around at all hours. This was my first foray into online fandom, and I made friends for life. Meeting the sraffies — as we called ourselves — was like coming home. Being with them was, like reading the books that had brought us all together, like being seen for the first time. I was able to relax and be myself and feel safe in a way that I hadn't really anywhere since becoming an adult. Ten years have passed since then, and the group of us have gone through so many things together. We've graduated from university, changed jobs and careers, had books and academic articles published, moved cities, emigrated, fallen in and out of love (in some cases, with each other), mourned deaths, and supported each other through whatever life threw at us. We travel specifically to meet up with each other, and if work, study, or holidays bring us by chance to each others' cities, we make a point to hang out. One of the friends I met through His Dark Materials was even a bridesmaid at my wedding. I recently did a reread of the trilogy, wanting to refresh my memory before reading Pullman's much anticipated foray back into the world of His Dark Materials. I was anxious that it wouldn't affect me as it had when I was younger, that I would pick up on flaws, that its emotional notes would leave me unmoved. I shouldn't have worried. Reading Pullman's words again, returning to that world, was like falling into water. Like the best and most meaningful of stories, it gave me something different, as it had done with each reread, and reading it as a thirty-two-year-old woman was different to reading it as a thirteen-year-old girl, or when I was in my twenties. But, like Lyra relearning to read the alethiometer as an adult after losing the unconscious ease with which she read it as a child, it was a deeper, richer experience — not better, not worse, just different. In the years since I first opened Northern Lights and read those resonant first words, Lyra and her dæmon, I've finished high school. I've graduated three times from two different universities, with an Honours degree, MPhil, and doctorate. I've changed careers three times. I've emigrated, lived in two new countries, acquired a new citizenship, learnt two new languages (as well as many dead languages), presented at conferences, been published academically in two very different fields, fallen in love, had my heart broken, and fallen in love again. In those years, I found my home, and I found myself again. In other words, I've done exactly what His Dark Materials urges: live, as much as I can, feel, as much as I can bear, and learn, as much as I am able. On Thursday, I will collect my preordered copy of La Belle Sauvage, the first of Pullman's prequel trilogy that will return readers to the world of His Dark Materials. I will sit down and read it in a desperate, yearning rush. I wonder what the twenty years that follow will bring. I know that having read this new book — and those that follow — will help me cope with whatever those next years throw at me. All this just to say--readers are so individual in their reactions that "never write something hurtful" is untenable. I think this is related to the going trend these days, which is to ask authors not to write works that are "problematic." But what do we really mean by that? Analysis of, say, racist or sexist elements in media is valuable, and we need more of it. But sometimes what I see is not that, but "don't write problematic works" in the sense of "don't write things that I consider hurtful." As I am neither trans nor nonbinary, I'm not going to dictate to trans/nonbinary people how they should respond to Palmer's books (which is not what yhlee is doing, either), except to say that I think yhlee is correct when he says that Palmer's future was a dystopia telling itself that it was a utopia, and that you cannot understand her novels unless you view them from this perspective. I’ve been watching conversations emerging — mostly on Twitter, mostly subtweeting, mostly in fits and starts — trying to categorize responses to the book according to some sort of ticky-box taxonomy of readers. I find this utterly repellent. Some people will suggest that only queer people have problems with the book, ergo it must write queer people’s lives poorly; others will counter with “well, Amal liked the book,” as if that could be the last word on the subject; still others will try to parse whether it’s my Brownness or my Queerness that has shaped my response, in pursuit of some sort of One True Response to the book. I've not read this book, and again, I have no intention of dictating people's responses to it, or telling them that they should read a story which they are going to find upsetting and hurtful. What I find troubling is the idea that people — particularly those of (multiple) marginalised identities — feeling they have to march in ideological lockstep and respond in identical ways to identical stories, especially if there's an implication that a divergent opinion calls their marginalised identity into question (or that they have to pick and choose between one or the other of their marginalisations, as if responding to a story in a certain way means they've prioritised their identity as a POC over their identity as an LGBT person). I have my own version of this regarding the rhetoric surrounding the 'proper' way to write women. For various reasons, partly because of my personal history, partly because of my lifelong narrative preferences, I respond much better — and will choose to read, watch or be fannish about — stories where the female characters are survivors of trauma, where their heroism has come at great cost, and where their powers are in spite of misogynistic pushback. I could list a thousand examples, but the first handful that spring to mind include the five Wives in Fury Road (victims of sexual violence), the clones in Orphan Black (who are quite literally viewed as patentable property without bodily autonomy), Jessica Jones in the Netflix TV series (a victim of sexual violence and mind-control), Laia from Sabaa Tahir's Ember in the Ashes series (who voluntarily allows herself to be enslaved in order to spy on her enemies, putting herself at constant risk of sexual and physical violence), Shahrzad from Renée Ahdieh's Wrath and the Dawn duology (a retelling of the 1001 Nights played fairly straight), Una from Sophia McDougall's Romanitas trilogy (an escaped slave with a traumatic history that's only hinted at, but which is fairly obvious if you read between the lines), Briseis and Chryseis from the Iliad (captured in war and victims of sexual violence) and Paige Mahoney from Samantha Shannon's Bone Season series, who begins the series in a very Stockholm Syndrome-y situation. I'm not saying these are the only depictions of female characters that I respond to — some of my favourite stories entirely lack this element! — but these tend to be the fictional characters that are closest to my heart, whose stories I draw on at times when I need courage, and inspire the bulk of my fannish feelings and output. What I don't respond to, and what is very low on my list of narrative priorities, are female characters who enter their stories already powerful, suffer no trauma, and wear their power joyfully and lightly. And yet I am constantly bombarded (at least in my corner of fandom) with categorical assertions that what female audiences want are untraumatised, joyful, uncomplicatedly happy female characters who revel in their power. This may be true for the vast majority of women and girls — as I said above, I have no intention of dictating others' storytelling preferences. But I'm told, in furious Tumblr post after furious Tumblr post, that the Whedonesque heroine — one who experiences her power as a kind of violation, and who fights at least in part as a response to trauma — is anathema, is unwanted, is hurtful to all female fans. But for me it is precisely this kind of character that gives me courage, because such characters tell me, over and over again, that I as a woman will survive, will be brave, will live on and find power in the support and community of other women, and that women with my experiences will get to be the protagonists of our own stories. Most of the responses to yhlee's post (outside of the comments on the post itself) seem to have been along the lines of well, this gives us lots to chew on without really engaging in the points made. My feeling is that we'll never progress beyond this point unless people are prepared to talk about the broad spectrum of reactions to stories, and allow for this range of reactions without trying to police people's identities. I have it somewhat easy. I'm not exactly starved for narratives of my chosen type: the world abounds with stories of traumatised women taking back power for themselves, although of course some stories do it better than others. When it comes to depictions of more marginalised identities, the dearth of representation is much starker. This is precisely why the solution to bad or limited representation is not to enforce a uniform response to this representation, but rather to do everything in our power to encourage and enable more representation. (This obviously means significant structural changes to publishing, film- and television-making, and a huge amount of work in amplifying marginalised voices and making creative fields less hostile to creators of marginalised identities.) I believe enforcing a party line when it comes to people of marginalised identities responding to fictional marginalised characters is deeply harmful. I also believe that the cure for this problem is as many stories as possible, so that everyone is spoiled for choice when searching for stories that speak to them. Today's topic is from geckoholic: talk about my favourite author or authors. For a bookworm like me, this is an impossible topic to narrow down - I have so many favourite authors, most of whom I like for a wide variety of reasons. I've limited myself here to just a handful. If you asked me to name just one author as my favourite, I probably automatically say Philip Pullman. This isn't necessarily because I think he is the best author in the world, but because he is the author who (unintentionally) has written the books that have given me the most. Oh, I have always loved his turns of phrase, the page-turning intensity of his plots, and his vivid characters, and the themes of his books have spoken to me for close to two decades now, but my love for him goes beyond that. When I read Northern Lights for the first time, it was like a resounding thunderclap, as if I had been given words to explain something I'd never been able to articulate, as if my (twelve-year-old's) worldview had been condensed and distilled into a single novel. And, as the years went by, Philip Pullman's writing gave me a career as a reviewer, my first introduction to online fannish communities, and a vast, international gang of friends who have been there for me through some of the best and some of the worst times of my life. I adore the writing of Kate Elliott because she writes epic fantasy with an eye, not to 'historical accuracy', but rather to how her imagined worlds function at every level - from the highest branches of the aristocracy to the artisans, farmers and merchants who keep things running. She is one of the rare epic fantasy writers who thinks both on a broad scale (the sweep of politics and history, the repercussions of a small event over a large period of time) and on a smaller, intimate level (the ripples of trauma and repeated mistakes within communities, families, couples). Her worlds feel lived-in in a way that I often feel is missing in more well-known, popular epic fantasy. She's the sort of writer who thinks about how characters pay for their possessions, what sorts of trade sustain large empires and small communities within them, what sort of family structures are common to particular societies - and how much scope is there for her individual characters to push back against various societal constraints. She's also responsible for one of my favourite characters of all time, Mai. Mai is slightly edged out as my favourite fictional character by two other authors' creations. The first is Noviana Una, from Sophia McDougall's Romanitas trilogy. McDougall is another of my favourite writers, not just because of Una, but because she writes about revolutions in a way that makes my heart sing. Her stories resonate with me, because, at their heart, they are about the dispossessed: escaped slaves, abused women, people marginalised by ethnicity or sexuality finding common cause, realising that they outnumber their oppressors, and, quietly, carefully, on their own terms, making revolution. That the revolution is run out of a never-destroyed Library of Alexandria by Una, an escaped-slave-turned-library-assistant is just the icing on the cake. Given we're on the topic of dystopias (the world Romanitas is most definitely a dystopia, even if the series is marketed as alternate history), I'll also mention two of my other favourite writers of dystopias: Victor Kelleher and Gillian Rubinstein. These two are Australian writers whose dystopian works were popular during my childhood in the '90s. I've been singing the praises of this genre for a really long time, and it's hard to describe why I think it's so excellent in just a few words. I think I keep returning to these works because they reward rereads (and I have definitely reread them at least a hundred times - not an exaggeration), and they speak to a particularly Australian understanding of postapocalyptic living, to a readership who already has an uneasy relationship with a hostile land and is carrying very specific colonial baggage. A couple of authors who I appreciate specifically for their beautiful use of language: Ursula Le Guin and Emily St. John Mandel. It's not that these writers aren't telling incredible stories and exploring really complicated ideas: they are. It's just that their words resonate, but in a quiet way, like a stone dropped in still water. I love Le Guin's Earthsea books, particularly the later ones, which I feel helped me understand myself as a woman. I really love what they have to say about the power and magic of ordinary, everyday work - the kind of work that is endless, unacknowledged and unappreciated, but absolutely essential (Monica Furlong is another author who has a lot to say about this particular topic). Neither Le Guin nor St. John Mandel is a comforting writer, but I find myself returning to their books again and again to give myself a sense of hope. I would be remiss to leave this post without at least mentioning Catherine Jinks, who showed me that you could write powerful, meaningful, thoughtful work that is aimed at teenage readers, upends conventional, popular understanding of historical events, and is utterly hilarious. Jinks also gave me Pagan Kidrouk, my favourite fictional character of all time, someone whose stories I've been reading for more than twenty years, and which are the first books I reach for as comfort reading. I could go on and on and on here, but I'll stop at this point before things get ridiculous. I think it's fairly clear that I like different authors for different reasons, but it's hard for something to be my favourite unless it provokes a great intensity of emotion - and sustains this intensity of emotion over repeated rereads, over a period of many years. While I can appreciate the craft of writing in an abstract way, I need to be made to feel things, intensely, and think things, intensely, for the writing to make any kind of impression beyond the time spent reading it. I'm still taking requests for this meme. You can do so here on Dreamwidth or here on Livejournal. I'm not sure I'm going to be able to manage it every week, but I'm going to attempt to post regular reading logs whenever I can. I tend to agonise too much about whether what I want to post about is worthy of blogging, and I'm trying to get out of that mindset. With that in mind, have my first Reading Wednesday of 2016. Uprooted by Naomi Novik was something I'd been intending to read for a while, but I have to admit that it was Foz Meadows' extremely negative (and spoilery) review that bumped it up into a higher level of priority. What can I say? The id wants what it wants. I loved the folkloric, fairytale quality of the book, coupled with its emotional intensity. And the idea of a malevolent, sentient forest was absolutely fantastic, and very cleverly realised. To my mind, European fairytales and folktales exist in this kind of nebulous, indeterminate, almost universal forest that spreads and covers the whole of their known landscape, a space in which the rules of the real world don't apply and operates under strange, inhuman rules of its own. (I think of it as the world's forest.) The idea to make this resonant, unstable forest space a living, conscious entity was inspired. I only wish that Uprooted was going to be the first in a series, but I guess that would detract from the fairytale finality of its ending. In any case, we'll always have fanfic. I read and really enjoyed 'Good Girls' by Isabel Yap, which adds fantastical elements to a story of friendship and coming of age - and coming to terms with the monstrous. The mythology of the Philippines underpins this story, the latest I've read by Isabel Yap, who is fast becoming one of my favourite short fiction writers. I read a lot of blogs, online essays and commentary pieces - far too many to link here. Instead, I'll link you to two pieces which share an emphasis on writing as construction, on the ways their respective authors go about building their fictional worlds. The first is Writing and Music Composition by Yoon Ha Lee. The second is The Map As Theory by Kate Elliott. What have you all been reading this week?